I'm the curator here at SS John W Brown and I LOVE MUSEUMS, no shame. A lot of stuff, or objects as we like to say in the industry, come across my desk and this one folder I am thoroughly enjoying. This file, object number 2016.25 (no accession numbers, I have a big pile of stuff so I consider it one big accession) is basically the sailing life of this one guy: Charles A. Scarpello. I don't know how we acquired this file, as with most of our objects. Most likely someone put this with a "lot" of other memorabilia on Ebay, it was then purchased by a Merchant Marine collector then given to us. That's pretty much how we acquire objects and we love getting more Merchant Marine objects! If you have anything you want stored securely in our archive, put online on our Omeka site for the world to see, then eventually put on display... we'll take it! 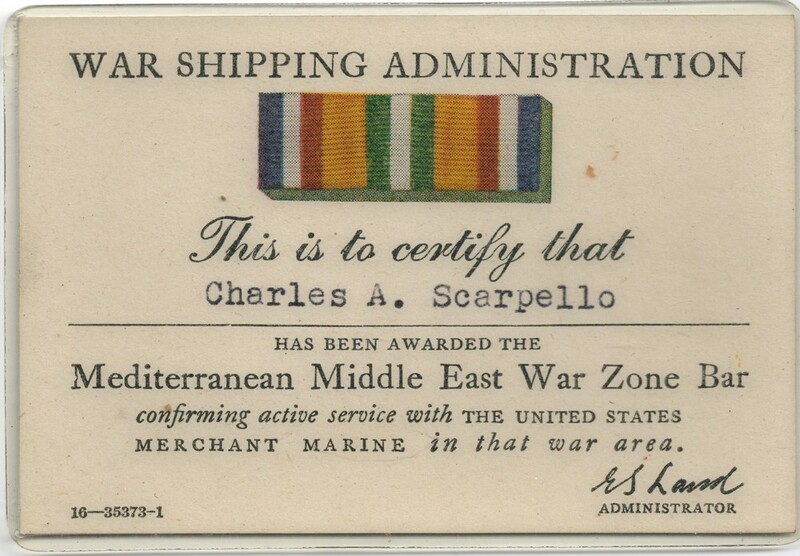 Mr. Scarpello sailed during World War II and was awarded at least these two awards for his service, but was not considered a veteran until 1988. These are pre-war discharge certificates from his sailing career in the 1930's. Note that the Department of Commerce regulated these until 1942, when the USCG took over regulation of the Merchant Marine. Also, note his rise through the ranks from Messboy, to Able Seaman, then Quartermaster (a type of specialized watchstanding Able Seaman who is proficient in navigational duties found on ships with larger crews). 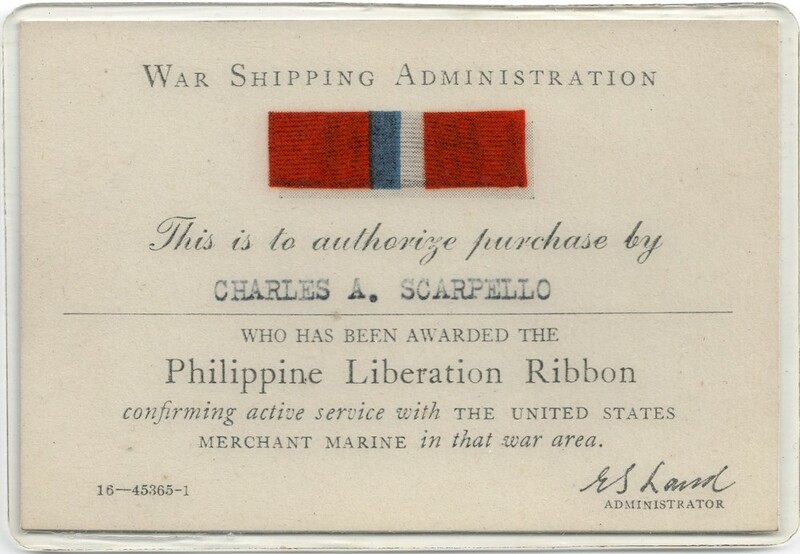 During World War II Mr. Scarpello then earned his third mate's license and thus became an officer in the United States Maritime Service. This government service (akin to the Lighthouse Service or Public Health Service) was a paramilitary government organization created to quickly and efficiently train personnel for the Merchant Marine. This was needed because Liberty Ships (requiring between 30 and 60 crew) were built at an average pace of 52 a month (that's 1,560 to 3,120 mariners by the way) for the duration of their respective shipbuilding program. This certificate was part of his training as an officer in the USMS. Mr. Scarpello kept sailing into the late 1960's and belonged to the union MMP (Masters, Mates, and Pilots), which many Merchant Marine deck officers are members of to this day. Note his travels to Vietnam during that war as well as Egypt in 1964. Well that's it for this week from the archives, check us out next week when I highlight another object and also check out collections website for your research and casual perusal!